After 13 years as a California schoolteacher, Joe Vasapolli decided to leave the Golden State in search of new scenery in central Texas. With new terrain came the urge to switch careers. The Burbank native pursued a position in the growing healthcare field as a certified nurse aide, but soon realized it was time to take the next step. 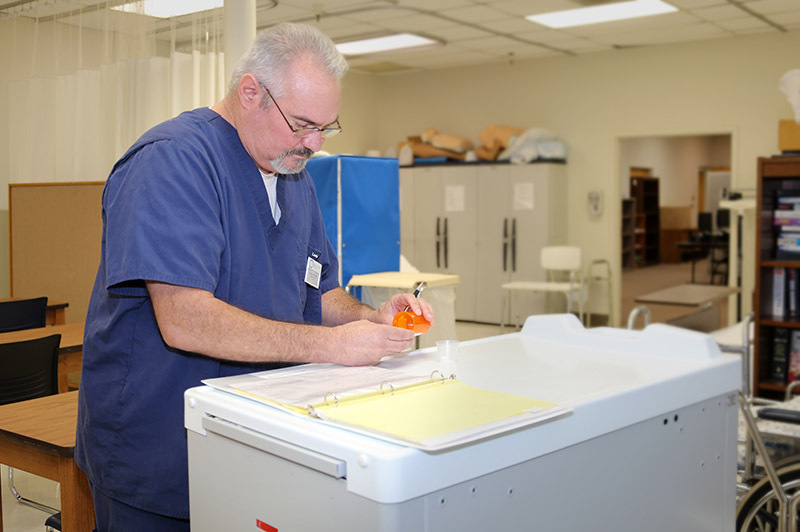 Vasapolli turned to the Blinn College District’s Certified Medication Aide Program to elevate his career. Administered by Blinn’s Division of Technical and Community Programs , Blinn’s three-month Certified Medication Aide Program teaches students how to properly prepare and administer medication in a licensed healthcare facility. Medication aides must understand medical and pharmacological terminology, abbreviations, and symbols, and manage medications for a large number of patients without error. The program consists of 35 four-hour classroom sessions and 10 hours in a clinical setting. Course curriculum is designed and implemented based on training assessment and certification standards set forth by the Texas Department of Health and Human Services. Licensed faculty with extensive experience and knowledge teach each course. Upon successful completion of the program, students are prepared to take the Texas Department of Health and Human Services Medication Aide Licensure Exam. Jobs opportunities for certified medication aides abound in long-term healthcare facilities, hospitals, correctional institutions, and assisted living facilities. Blinn will offer its next Certified Medication Aide course beginning Tuesday, Jan. 29, at the Post Office Campus located at 301 Post Office St. in Bryan. The $805 course will run through Tuesday, June 4. For those already licensed as certified medication aides, Blinn offers a monthly $75 refresher course that meets the requirements of the Texas Department of Aging and Disability Services. The 8-hour course includes specific training and review in the preparation of administration of medications, documentation, licensing standards, safeguarding of medications, drug reactions and side effects, and updated and new medications on the market. Students who successfully complete the course receive an updated certified medication aide permit from the state. A new Certified Medication Aide refresher course will be offered from 8 a.m. – 5 p.m. Saturday, Jan. 19, at the Post Office Campus. For more information about Blinn’s Certified Medication Aide Program and Renewal, visit www.blinn.edu/workforce/certified-medication-aide. Blinn’s technical and community education courses provide students the knowledge and ability they need to enter the workforce immediately after completion of the courses. Many of these courses do not require a high school diploma and enrollment is fast and easy. As most of these courses are non-credit, students do not need to go through the College’s admissions process to enroll. Programs vary in length and are offered with daytime, evening, and weekend options. Business owners can enroll their employees in Blinn Technical and Community Education courses using Texas Workforce Commission Skills Development and Skills for Small Business funds, and Blinn staff can help businesses complete the request form. Blinn also offers students access to scholarships through the Blinn College Foundation, private grants, and Workforce Solutions. For more information or to register for these courses, visit the Blinn Post Office Campus at 301 Post Office Street in Bryan. For additional information, visit www.blinn.edu/workforce or call 979-209-7205.